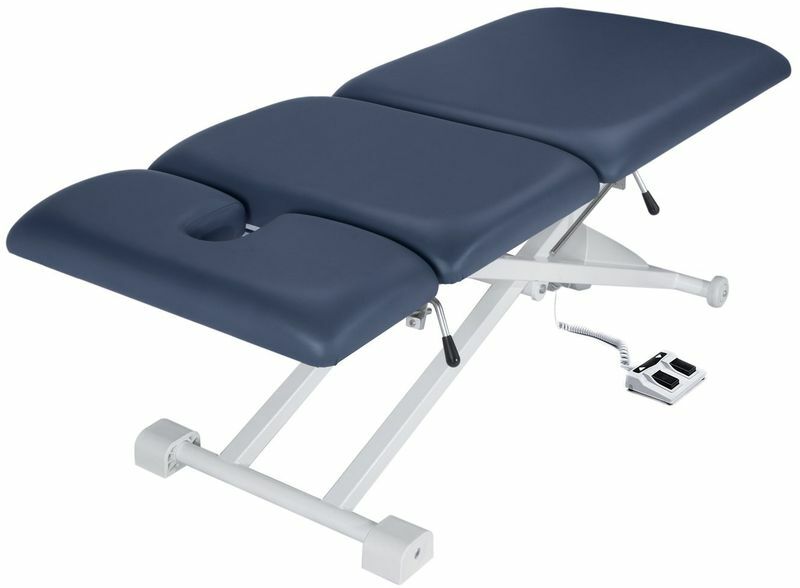 The 29” TheraMaster 3 Section Treatment Hi-Lo Table is a versatile table suitable for a wide range of modalities, including physiotherapy, massage, acupuncture, osteopathy, beauty treatments, examinations, or any multi-modality practice. 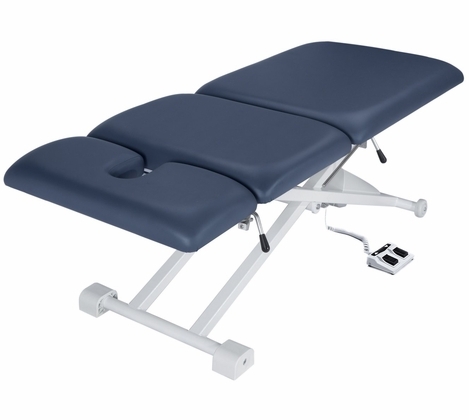 The three-section configuration features a 38” backrest and a 22” seat section making it better suited for treatments that require extra leg room - ideal for examinations, waxing, or physiotherapy. A classic metal mechanism backrest and leg rest system may be adjusted through a wide range of angles very easily. The power driven height adjustment allows easy access for elderly and incapacitated patients while also achieving an ergonomic working platform for the practitioner. A One side added wheels system allows easy maneuverability when required. • A rugged steel frame, durable and reliable CE and UL listed actuator, at the step of the foot control, the table easily adjusts from 21" to 34". • The 550 lb. Weight capacity secures and lifts large patients with ease, while the low 21" height setting simplifies difficult patient transfers. • 2.5" thick cushion of Multi-Layer Small Cell foam, patented to be more dense than standard foam. The Royal Blue PU upholstery is oil- and water-resistant, CFC-free and with denim-like reinforcement backing for extra durability. It's protected by a 5 Year Guarantee. • Maximum working load: 550 lbs. • Height range: 21"- 34"
• Padding: 2.5" thick cushion of Multi-Layer Small Cell foam. Sign Up for Our Email Newsletter to be the first one to know about special offers and new products! 2019 © MassageTools.com, Sundaes Novelty, Inc.